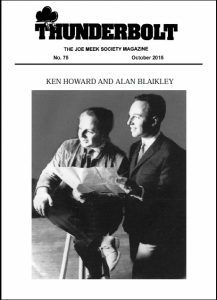 Essential reading for all Joe Meek and RGM Sound buffs – and it comes free when you subscribe to JMS membership. FREE SAMPLE! – To receive a digital copy of our Thunderbolt Magazine just contact us. Digital copies are just £0.99 each – contact us to arrange payment and download. If an issue is featured below it is not proof of it’s back issue availability and you are advised to contact us first for updated availability and prices. Who Owns The T-Chest Tapes? Lots of interesting points raised at the 2010 meeting. career as one of Britain’s leading impresarios. Fascinating story of one of the genuine last groups to be recorded by Joe. Alan Caddy sadly passed away (aged just 60) in 2000. Ten years on, Alan Blackburn looks back at his life and career. Ron Bowdery gives a detailed account of the group and their RGM years. A previously unseen publicity photograph of Heinz. David “Detective” Peters gives the lowdown on recent Internet RGM activity. 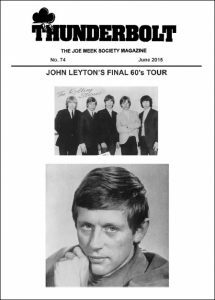 To celebrate John’s 50 years in the music business – Rob Bradford has researched the BBC’s previously unread files on John Leyton. Another selection of recordings paying tribute to our hero. A poetic tribute to Joe by Steve Amber. This section is always worth reading as it is packed with information. Anna Mendez is a ground – breaking dance artist in the USA. Inspired by “I H A N W” – her performances have drawn critical praise and acclaim. Mark Newson presents his usual round up of RGM snippets / nuggets of information. Mark Newson reviews the classic 60s series. Brian Woods reflects upon former RGM artists who have sadly passed away during the past few years. Mark Newson tells the story of a little – known guitarist with both RGM and Shadows connections. A review of a 2 CD set crammed with 50+ Meek engineered tracks. Many obscurities on CD for the very first time. Back in 1997 JMS member and recorded sound expert John O’Kill (now sadly deceased) exhibited some vintage tape recorders for the society. Shortly afterwards he recorded a gig featuring Dennis D’Ell and Honey Lantree. A wonderful article details it all. Tony Grinham became close friends with Joe. They shared an interest in the paranormal and the occult. A fascinating account of their real life adventures and experiences. Meek expert (he founded the original RGMAS) Jim Blake lived close to Holloway Road. He provides a richly detailed account of the area from half a century ago – coupled with nostalgic photographs. Meek ‘Information Hound’ David Peters has all the details of recent Meek – related activity on the Net. 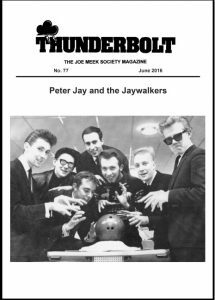 Chris Liddiard recalls meetings with Joe Meek during 1958. 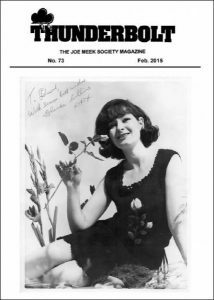 Penny Likorice was an 18 – year old back in 1964 when she became Joe’s secretary for c. 6 months. A lovely first – hand account of her RGM days. As ever, an amazing selection of letters and replies. The Honeycombs in Japan, more unreleased RGMs. Memories of Biddy Meek. The story of the Wolves etc., etc. Mark Newson recalls the life and times of the Puppets lead guitarist. Robb Shenton adds his own tribute. Rob Bradford tells the story of Sutchy’s brief and zany spell as a Pirate DJ in 1964. Bobby has recently returned to live performing. He has his own website and you can book him for your own private event. Details here. JMS members offer up their personal views on last year’s Meek biopic. Meek / RGM expert Alan Blackburn details the full background and story of the short – lived but ground – breaking label which featured some of Britain’s rarest 45s, EPs and LPs. Tony Grinham’s original accounts appeared in the long out – of – print Thunderbolts #7 & #8. Rob Bradford re – writes the story as well as checking on events during the intervening 40 years. Creepy! A review / summary of a brand new 62 track double CD of Joe’s engineering / sound balancing exploits. 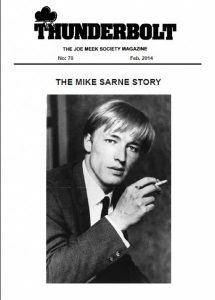 Mark Newson recalls the life and career of the late Mike Battory who was vocalist / guitarist with RGM group The James Boys. Chris Miller and Mark Newson cover the interesting career of this neglected and forgotten group. Previously unseen photographs of Joe Meek and the Tornados at a charity event (MENCAP) in Cinderford. 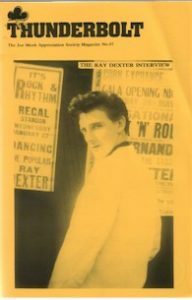 Tex Rardey interviews Ray Dexter about his long songwriting career. A brief 1960s snippet about Joe’s ‘answer’ to the Everly Brothers. A superb and moving tribute to the late drumming legend by Mark Newson. Packed with photographs and information. Mark Newson pays tribute to the big – voiced Canadian baritone singer. Rob Bradford reviews John Leyton & The Flames brand new 2009 CD. Tons of fascinating readers’ letters / comments and equally interesting / informative replies. Dave Cannon sent in a newspaper article from the I.O.W. with information about Pat Reader in 2009! Rob Bradford reviews the soundtrack CD issued to coincide with Telstar: The Movie. Robb Huxley’s tremendously detailed and colourful journey of the group’s latter day career continues. Additional information by Mark Newson. Trevor Simpson reviews a brand new Instrumental CD which features 6 RGM classics. Students Fidel Villeneuve and Brian International talk about several months living at 304 in 2001. Brief update of Ray Dexter in 2009. The minutes of the 2009 AGM held at Newent plus reports from chairman Ken Ledran and other JMS officers. Tom Jones with one or two Joe Meek anecdotes…transcript of an interview from the Michael Ball show. Mark Newson explores the similarities and tragedy surrounding the turbulent lives of three iconic figures in popular culture. Some great information contained within informative letters and equally informative replies. Fascinating interview with the man behind “Sloe Eyed Eastern Maid” and much, much more. A superb photograph of Joe’s childhood home courtesy of Sandra Meek. Mark Newson’s excellent overview of Jimmy Page’s early career – particularly his spells with Neil Christian and Joe Meek. A short feature where Gene relates tales of Joe Meek, Phil Spector and Brian Wilson. To commemorate the 10th anniversary of Dave Sutch’s death – a great selection of photos, articles and interviews. Thanks to Neil Newsome for interview transcript. Mark Newson compiles cuttings, photographs and interviews with the stars, directors etc. A comprehensive overview. Overview of Joe Meek’s career from The Independent newspaper. Robb Huxley provides a compelling first – hand account of the tragic events of February 1967 and the resulting aftermath. Patrick McGoohan passed away in 2009 aged 80. Mark Newson recalls Danger Man, now available on DVD. Several pages detailing Ray’s post – RGM career. A little feature from the N.M.E. with the Tornados on the set of the film. Mark Newson and Ian Stewart tell the story of Mick Flynn who helped to found the Packabeats. David Wells relates the history of this forgotten group who recorded several tracks at 304 Holloway Road. Mark Newson covers Tab Martin’s career in the Tornados, the Saints and the Peddlers. Another fascinating collection of letters from JMS members, plus some great replies from our experts. Mark Newson pays tribute to the legendary Jimi Hendrix Experience drummer who also recorded with Joe Meek. Mark Newson interviews the larger than life Robb Shenton about his RGM days in the 1960s. Daniel Heeney recalls his days on the Telstar film set. Plus photos of the Rapiers & JMS members who were also involved. Robb Huxley continues his amazing first – hand account of life in the group. The year is 1966. Mark Newson recalls the classic children’s TV show. 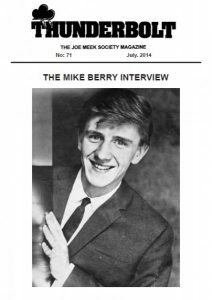 George Robinson has a detailed account of the group’s history on Bill Harry’s Merseybeat website. Ritchie Routledge (also from the group) disagrees with much of what is written there. Here, he offers his own detailed and fascinating account. A letter from Joe to a Mr Baxter who wishes to issue a potential LP by Heinz. 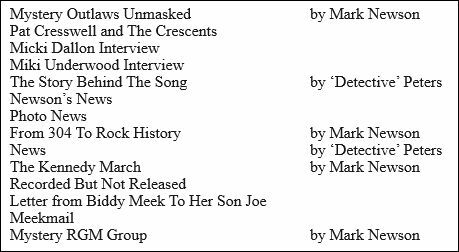 Mark Newson details unreleased RGM tracks from the Manish Boys (later to include a young David Bowie). Gloucester Citizen feature about the then upcoming 2008 Joe Meek Festival. 8 pages of fascinating and informative letters (plus equally fascinating and informative replies) from JMS members and experts. Mark Newson’s very enjoyable and informed survey of those great 60s stations before the days of Radio 1. Bob McQuillan recounts some of his 60s memories. Robb Huxley continues his amazingly frank and detailed account of life in the Tornados during 1966 – including the Aberfan disaster fund concert and the notorious Kray brothers. Mark Newson (aided by Steve Nash) pays tribute to drummer Mickey Waller from his days with the Fleerekkers then on to Rod Stewart & Jeff Beck before his tragic descent into alcoholism. ‘Missing presumed dead’ for 40 years – Houston Wells is interviewed at length by Spencer Leigh. Several years in the making – this project is a ‘must see’ for all Meek fans – but screenings have been limited in the UK. John Cavanagh offers up his incisive views. Bob McQuillan and David Peters relate the story of the Crescents. Nice insights into the late 50s / early 60s music scene. Mark Newson recounts the story of forgotten Wild Boy John Andrews. Although he was only with the group for seven weeks – it’s all very interesting. An overview of Ray’s career focussing on his most recent activities including a new CD. Previously unknown young female singer who recorded two tracks with Joe Meek in 1962. Mark Newson tells her story. Journalist Duncan Eaton knew Heinz well, in fact he’s written a biography of Heinz. Sadly – publishers aren’t interested. Duncan relates some recent radio interviews etc talking about Heinz. Detailed account of the 2008 AGM. Plus all of the officers’ reports. Mark Newson reveals the fascinating career (pre – Moody Blues and Wings) of guitarist Denny Laine. Mark Newson looks back over the career of the multi – talented Mr Lyttleton. Humph hated what Joe did to Bad Penny Blues – until it became a hit! Mark Newson checks out this cult action series starring the enigmatic Richard Bradford. Many more interesting letters & replies from JMS members. All very informative. Horrific murder, as reported in the Citizen of 1938, with similarities to the Bernard Oliver case of 1967. A nice little article about the way we were (and retail prices) in the 1950s. Guitar maestro Colin Pryce – Jones of the Rapiers recalls happy days backing former RGM acts etc. Mark Newson reveals more hidden unreleased gems. Garth Banks details the background of the early budget label and both his father’s and Joe Meek’s connections with it. Who were the Telstars? Why – none other than Bert Kaempfert (of A Swinging Safari fame) and his Orchestra. Mark Newson reviews Houston’s brand new CD and reproduces a rare photograph of the Premier Aces. No, not footballers – but an Irish showband. Houston was their lead singer. Mike Lloyd gives a richly detailed account of the band who recorded for both EMI (Norrie Paramor) and RGM (Joe Meek). Fascinating article featuring some great photographs. JMS Chairman Ken Ledran gives chapter on verse on this much under valued group. The Trad Jazz boom was huge in the early 1960s and Joe had recorded the very best (Ball, Barber & Bilk) in his time. In 2007 Norman Hale made a rare visit to the UK to attend the Joe Meek Fest at Newent. There he was interviewed by Rob Bradford and Ken Ledran. Be prepared for some startling revelations. 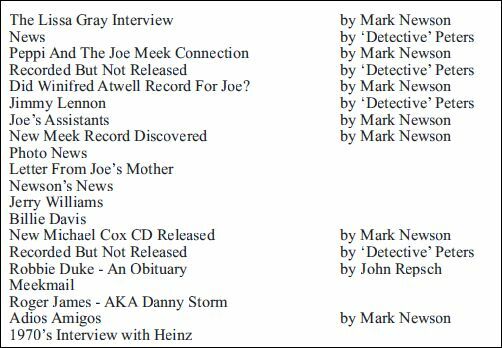 Mark Newson put together a CD of RGM rarities (Tornados, Geoff Goddard etc) culled from impossible to find acetates etc. Wonderful! Mark Irwin takes a brief look at the early days of Joe’s recording career. Tom Ewing’s excellent insights vis – a – vis this RGM classic. Mark Newson summarises what little is known about singer Carol Jones – who recorded one RGM single then disappeared forever. Rare photograph and brief summary of the group – courtesy of Neil Newsome. Craig Newton provides some great information on some rare RGM acetates. Ken Ledran’s splendid account of the 2007 event. Craig Newton’s equally splendid account of the 2007 event. Another great selection of news, views, opinions and information. Svein Sorli provides a unique insight and great photographs re: Danny Rivers Norwegian visit way back in 1961! 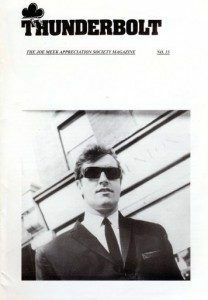 JMS member Chas Collick has put together a whole CD of unique Scopitone recordings – some with Joe Meek connections. Fascinating! Fantastic early photograph plus Mark Newson summarising the group’s pre – Quo Palominos days at 304. Pete Hurrell tells the full story of yet more unreleased gems lurking amongst those Tea Chests! Robb Huxley’s enthralling first – hand account of the latter part of the group’s career. The summer of 1966 is examined in minute detail. Tom Hammond provides information and a remarkable discography of Clem’s many, many sessions. Peter O’ Flaherty tells the story of yet another long – forgotten group who recorded for Joe. Mark Newson examines some of the conflicting stories surrounding the group who provided the very last RGM chart hit. Mark Newson’s obituary to and story of the wild bassist’s career. A recent newspaper interview with the colourful Mr Dexter. Mark Newson takes a look at key musical and social events taking place in 1967. Following the hot debate about ‘who played on what’ – Rob Bradford investigates how some of these seemingly untrue claims probably arose. 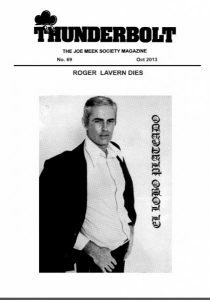 Fascinating newspaper feature about the remarkable Roger LaVern. Local features about the Newent event. Gaylord Fields examines the Meek / Spector debate. Rob Bradford reviews the Packabeats CD containing a mix of old and new tracks. Excellent! Chas Collick provides a fascinating summary of many rare Scopitone tracks. He’s compiled many of them onto a CD for all to share. Mark Newson’s unique insights into what went on behind the scenes of the controversial film. A little snippet / collage with regard to Telstar. News and information from the 2007 AGM. Craig Davies looks at the background during 1962. The strange tale of a remarkable fraud. Concert pianist Joyce Hatto released over 100 Classical recordings masterminded by her husband….William Barrington – Coupe (formerly of Saga!). But all was not quite as it seemed. Tony Searle provides some interesting information about these two RGM groups. 40 years after Joe’s death Mark Newson takes a retrospective look over the tragic events of the time and examines some new theories – with startling results. Was Joe murdered by the Kray brothers? Comments from the official guest book at the 2007 Gloucester exhibition. Various views vis – a – vis Joe Meek / Phil Spector comparisons. Mark Newson examines the claims that session players appeared on some classic RGM recordings. Early in 1966 David Peters visited 304 Holloway Road. In 2007 he returns and reflects on his experiences. An article looking back on a gruesome murder case from 1967. Robb Huxley’s amazingly detailed and personal accounts give us all an amazing insight into the minutiae of life as it really was in the Tornados. It certainly wasn’t all glitz and glamour! 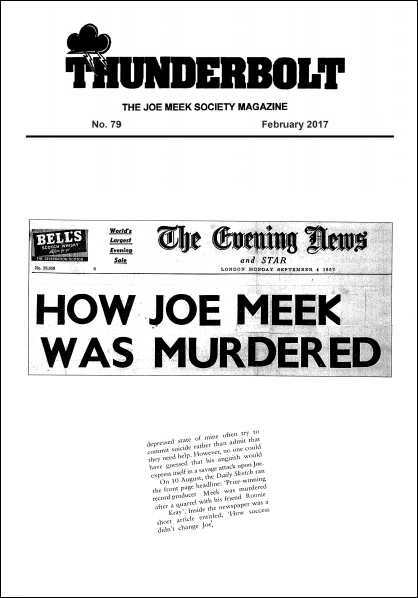 Joe Meek – Suicide or Murder? Nick Garrard is an RGM stalwart from the very early days. 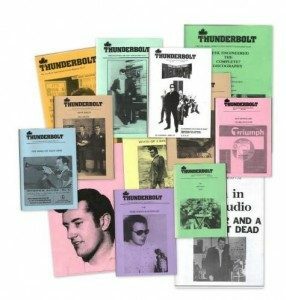 A huge Joe Meek fan and record collector, Nick did loads of work re: Newsletter / Thunderbolt too. In 1997 he set himself the monumental task of putting together a Stateside RGM discography. Here it is. Excellent research and also filled with great repro labels, pic sleeves, photos and Nick’s wonderful graphics. Following a lengthy Dave Adams interview – he appeared to change / contradict many of the things he’d previously said to John Repsch. Hence the redoubtable JR penned this most interesting missive. Part 3 of John Repsch’s excellent interview with Alan dating from July 1985. John O’Kill’s excellent summary of lots of the valve equipment employed by Joe in his studio set up. 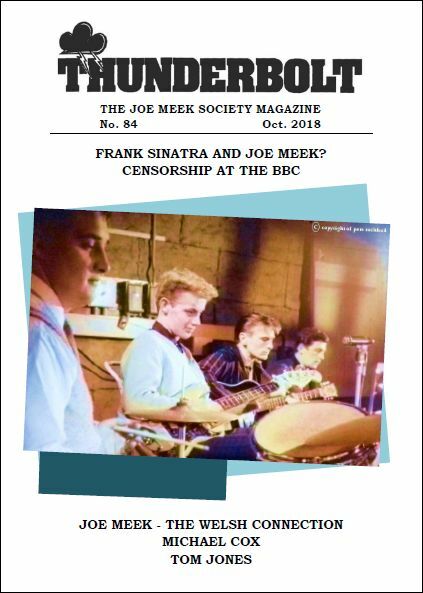 Laurence Brown’s masterly and unique article about Joe Meek’s days as ‘FX Man Supreme’ for the May Hill Amateur Dramatic Society in the early 1950s. Such productions as “The Poltergeist” and “The Ghost Train” gave Joe plenty of scope. Marvellous. Helen Gilbert – Voss spent a considerable amount of time and effort successfully obtaining Joe’s National Service Medal for the Meek family. A great personal account. A wonderful selection of photographs and memorabilia from the very successful exhibition held at the Lord Nelson. 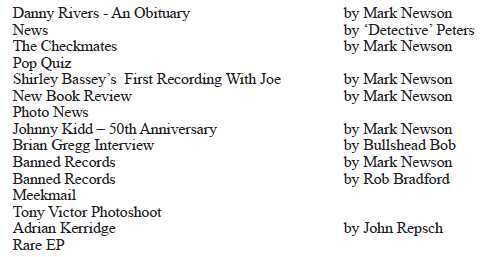 All areas and periods of Joe’s life and career are covered. 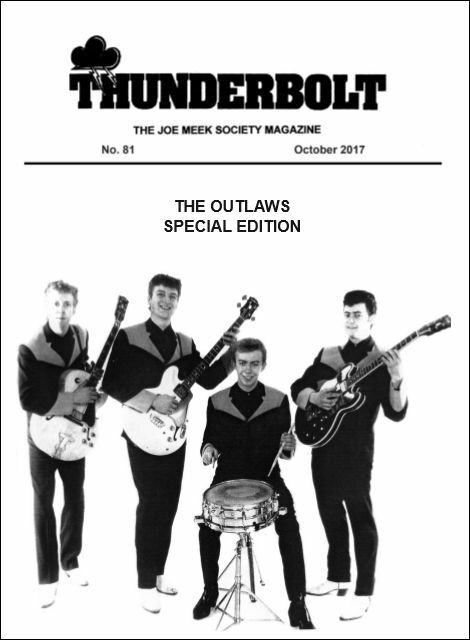 John William Jones and Robert Newman recall how they became interested in Joe Meek and what it all means to them. Mark Newson’s heartfelt poetic tribute to Joe. 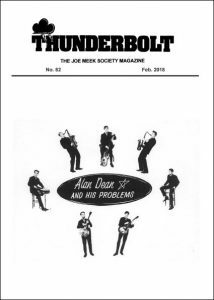 Another fascinating collection of readers’ letters on a Joe Meek / RGM theme. ADAMS, DAVE (Interviewed at Lichfield)Dave Adams was very close to Joe in the pre and early RGM years. During the course of this interview he throws new light on those days. Many of the Joe Meek audio products were featured at the Kensington Olympia event. Part 2 of John Repsch’s lengthy and informative interview with Alan, dating from July 1985. The late John O’Kill had a wonderful way of detailing Joe’s studio equipment in a way that ‘lay’ readers could understand and yet was still technical enough for the experts too. Members of the JMAS Midlands Branch describe their visit to the legendary studios and their meeting with Adrian Kerridge. Daphne Bonnet shares her memories of Joe and 304, Holloway Road. 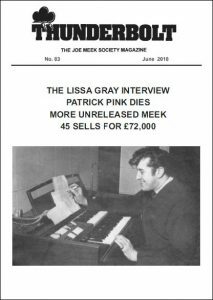 More pages of views, opinions, questions and answers – all Joe Meek / RGM – related. John Repsch interviewed Alan at great length (5/7/85 – Part 1) and elicited some wonderful anecdotes / information from him. Tom Hammond’s fact – filled feature on Clem’s career. Keith Hunt was a walking Pop Music encyclopaedia and an RGM fanatic. Sadly he passed away in 1996 at the tragically early age of 43. 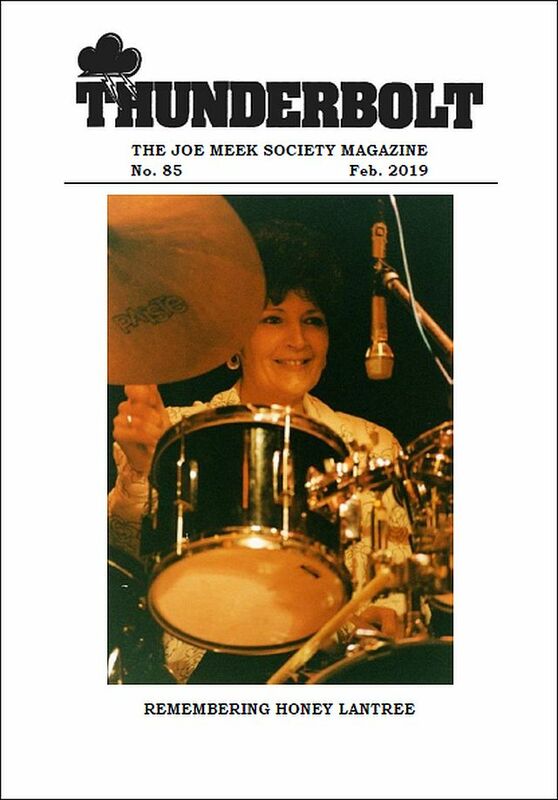 A great article about Joe and his influence on sound recording by Dennis Diken (Smithereens’ drummer). 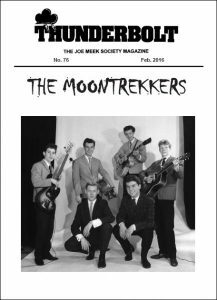 Jim Blake relates the events leading up to the very first Joe Meek / RGM retrospective LP from way back in 1977. Another fascinating cornucopia of news, views and trivia. Part 2 of John Repsch’s fascinating interview (31/7/85) with the hilarious, irreverent and volatile group members. Steve Fay did an enormous amount of work on the Radio Library and he details some of the gems residing there. Renowned author Irwin Chusid presents his unique survey of Joe’s influence re: recorded sound. John Repsch must have had great difficulty keeping things on track. On July 31st 1985 he interviewed the legendary group. Fascinating and outrageous comments abound! Includes Dave Adams CD, Heinz CD etc., etc. A wide – ranging open interview conducted in Sheffield. David John, Dave Millen (Puppets) and Brian Woods (Wild Boys etc) were amongst those present. CAVEAT EMPTOR (Beware of RGM fakes)Mark Newson’s excellent exposition on how to tell genuine RGM discs / acetates from fakes. There are still many unscrupulous individuals / dealers trying to defraud collectors. Wonderful interview (+ featurettes) with the Fabulous Flees, crammed full of information. Interesting photos from the Joe Meek book launch, return to 304 Holloway Road etc., etc. The society used to run a photo shop (193 pictures at the time). Fascinating to see what was available in days gone by. Another great audio device inspired by Joe’s own 1960s equipment. ‘Why Do We All Love Joe’? A lovely poem by Geoff Woodley. Another great selection of letters and replies. So much information contained therein. The early days of the 100 Club are recalled by Trad giants messrs Ball, Barber & Bilk (all of whom were recorded by Joe). RADIO LUXEMBOURG (‘The Station of the Stars’ indeed! Before Pirate Radio, the notorious (reception – wise) ‘Luxy’ was essential listening for Pop – starved teens. Their Christmas Annuals were superb. Pages with RGM refs are reproduced here. John Repsch interviewed the Holder Brothers at some length way back in 1983. Priceless information as well as reproductions of several letters written by Joe. A newspaper article covering various aspects of John’s life / career. A review of the critically acclaimed compressor – plus, a brief interview with Ted Fletcher. John Moorhouse’s (‘It Takes Me Back To Blackpool) personal RGM memories from the early days. Another fascinating treasure trove of views and information. The much missed Keith Hunt delineates Andy Smith’s (aka Houston Wells) career. Brian Wood played guitar for Freddie Starr and Heinz amongst others. He tells some great stories from those times and there are wonderful photos too. Interesting newspaper feature about his crazy Lordship. BELLAMY, JEAN (George Bellamy’s ex- wife interviewed)The former wife of the original Tornados rhythm guitarist talks about his life and career. Jim Blake founded the original RGMAS on the day Joe died. Here he describes how he built up an impressive collection of RGM discs. Many former RGM Artists were ‘inducted’ into our very own ‘Hall Of Fame’. Here’s a nice selection of facsimile autographs etc. An interesting selection of photos drawn from various events. A mixture of RGM stars and society members. In the early 1990s a whole range of recording equipment was launched, based around the RGM sound. Here’s all the technical low down. Member Ian Graham recalls why Joe Meek is so special to him and how it all began. Mike Stax’s masterly overview of Joe Meek’s career and influence. As usual – an amazing collection of news, views and information. Johnny Parker recalls the Bad Penny Blues session and talks about Joe. Fascinating interview with Harvey Richards who worked with Joe during the last four months of his life. Includes a copy of the very last letter that Joe ever sent. Lots of wonderful information and photographs from this interview with the band members. A great LP and one of Joe Meek’s most amazing feats of live engineering. Mike Stax discusses the group and I Hear A New World. The late Mick Hill (Rock You Sinners magazine) sums up Glenda’s career perfectly. Better known nowadays for Postman Pat, Bryan Daly was a serious musician in the 1950s. He talks to John Repsch about his dealings with Joe Meek. David Peters (now a JMS stalwart) was the teenaged manager of the Undecided from Falmouth. In 1966 they travelled up to London to meet Joe Meek. Brian Woods relates some interesting facts and talks to former Blue Grass Boys Denny Wright & Jack Fallon. John O’Kill expertly describes more of the recording equipment to be found in Joe’s studio. Matthew Coxall (Honey’s son) surveys the group’s career and 1994 reunion. George Stapley reports on their reunion show at the Mildmay Tavern*. Philip Hutchinson guides us through Simon Goddard’s unusual and unique film tribute to Jo’s life and work. Jim Blake takes the BBC to task for their flawed portrayal of Joe in a BBC play. More fascinating pages of readers’ letters and informative replies. The late Keith Hunt (+ The Times) pay tribute to Anne Shelton who passed away in 1994. Joe, of course, engineered Lay Down Your Arms. John MacElhone’s brilliant early effort to catalogue all known versions of Telstar. John Repsch talks to Gunilla Thorn and Jan Oloffson about her time at 304 Holloway Road. Ugly Things editor Mike Stax guides us through the main career highlights 1961 – 1966. Mick Mirams’ sterling efforts to list out who exactly played on all of the Tornados’ various releases. Terry Custance reviews the first ever reissue of the classic EP on CD. Philip Hutchinson’s excellent review of a splendid CD crammed full of unreleased gems plus a few turkeys. Rob Bradford interviews the drumming legend about his brief stint at 304 Holloway Road in 1961. An interesting account about the group’s days recording with Joe Meek. Soundtracks’ drummer Chris Warman recalls his days backing the Dowlands. John O’ Kill expertly annotates some of the recording equipment to be found at 304 Holloway Road. Ian Watson recalls his meeting with Eric Meek, which includes some typically forthright and outspoken remarks. Several pages of interesting letters and replies from JMAS members. 4 pages of photographs from the historic plaque unveiling ceremony and the memorable gig which followed it. Documents and an annotated list relating to the disposal of Joe’s personal and studio effects in 1968. 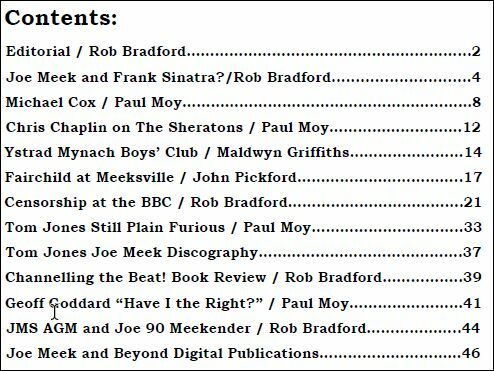 Kim Pavey provides some facts and figures re: some of Joe’s most successful RGM releases. Terry Gibson interviews drummer Paul Holm about his days with the Syndicats (with thanks to Mike Stax). Alan Blackburn’s brilliant series re: unreleased RGM material continues. Outstanding – but too short! An article from January 1963 following the release of Globetrotter. Houston Wells had seemingly disappeared for nearly 40 years. Noel Laverty describes early attempts to trace him. Helen Gilbert Voss sensitively explores aspects of Joe’s state of mind and mental health especially during 1966 / 67. Joe’s former office boy / studio assistant Roger Harris is interviewed by Mike Stax and Mark Neil. Fascinating first – hand insights. Mark Newson tells the story of one of the last groups to record at 304. More pages from John Repsch’s exhaustive book interviews with Peter Couzens of the Barbecues. Alan Clayson’s epic book about ‘Mortality In The Popular Song’. Plenty of RGM contenders. Kim Pavey offers up an insightful review. Mark Newson tells the stories behind the group’s 1964 visit to 304 Holloway Road. Recording expert John O’Kill summarises a lot of the important recording equipment found within the walls of 304 Holloway Road. An interesting item about John Leyton from the N.M.E. of May, 1962. Mark Cunliffe, Chris Davies and Darren Vidler tell the interesting stories behind their initial ‘discovery’ of Joe Meek and his wonderful recordings. Lots of interesting letters (and replies) from JMAS members. Mark Newson and P J Fuller with their very own ‘odes’ to Joe. Alan Blackburn with an all too brief feature about the legendary tape archive. 1993 article about the Telstar Tour and promoter Mark Lundquist. Alan Blackburn concludes his story about Gerry Temple’s career. The late, and sadly missed, Keith Hunt reminiscing about being behind the scenes at the Telstar Tour. John Repsch’s book interviews with Peter Cozens of the Barbecues. Sizzlin’ Hot indeed. JMAS member Philip Hutchinson describes his adventures in sound recording whilst attempting to emulate Joe Meek. Roger Smith talks to audience members following a Telstar Tour show in 1993. Several pages of very interesting readers’ letters (and the replies to many of them). 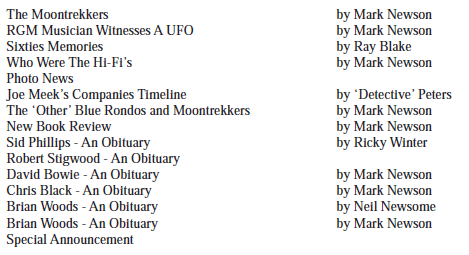 Sixteen additions to the then known RGM Discography. Still a ‘work in progress’ but the vast majority of RGM tracks were known by this time. Chris Davies looks at seven singles with a sort of RGM sound about them. 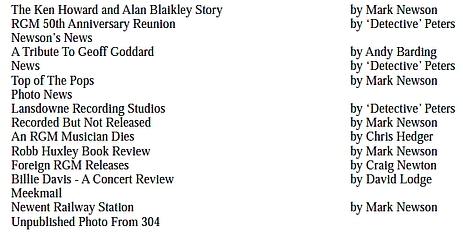 Alan Blackburn (the only person to have heard all of Joe’s surviving tapes) provides unique inside information re: ‘Forgotten Masters’. Alan Blackburn concludes his account of Gerry’s (aka Keith De Groot) career. Some major sociological and musical events of the year. A full page photograph from 1965 from the set of Ready, Steady, Go! In shot are Heinz, The Wild Boys, Tom Jones, Jack Good and Cathy McGowan. Superb! Back in 1991 / 1992 there was an outside chance of preserving the site of 304 as a Joe Meek museum. It all eventually fell through. John Repsch depicts the sequence of events and the stories behind them. JOY & DAVE ADAMS (Alan Blackburn covers their careers up to 1963 / 64). Alan Blackburn continues his account about the lives and recording careers of Joe’s teenage protégés. Focussing upon Burr Bailey and Silas Dooley Jnr! 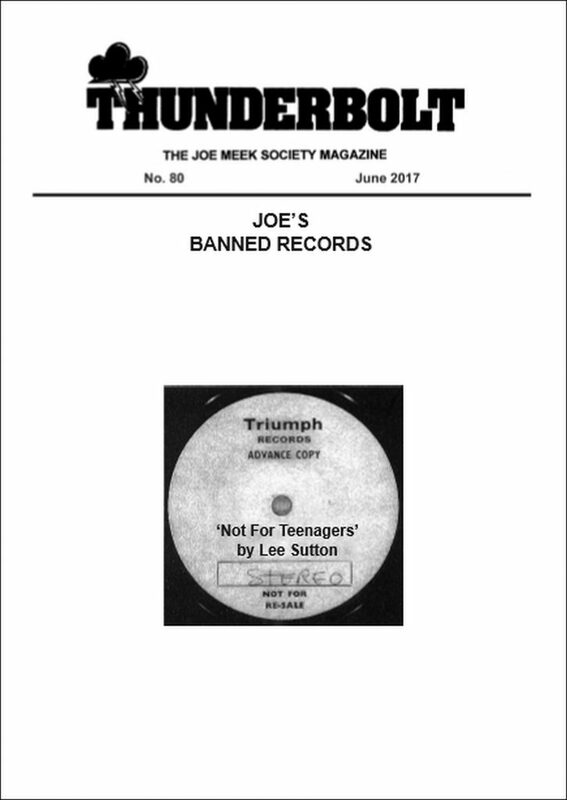 LEGENDARY JOE MEEK (THE) – THE TELSTAR MAN (biography). Fascinating text cut from the final draft. John Repsch had to cut back the huge amount of information assembled for the book. Here are three pages of text which didn’t make it to the final draft. Lots more fascinating information here! A great portrait of Joe plus a collection of cuttings reflecting people’s reaction to his death. A local paper (Yeovil) runs a little feature about four RGM members (Dave Baxter, Robert Inkpen, John Norman & Andy Steele) who were helping to keep Joe’s memory alive way back in 1992. A feature devoted to the activities of October, 1992 when a plaque commemorating Joe’s birth was unveiled in Newent. Reprints of various pages from the Gloucester Citizen reporting on Joe and events in Newent during 1992. A cutting from the Record Mirror (21 / 9 / 63) charting the background of the band from their early days in Preston to 304 Holloway Road. Matthew Arnold’s moving ode to the departed. 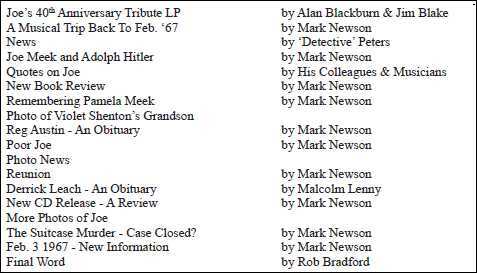 This was read at Joe’s graveside by Mark Newson during the special Joe Meek weekend at Newent in October, 1992. Photograph included. The first Readers’ Top 10 tracks of 1993. Favourite – Telstar. Least favourite – You’ve Got To Have A Gimmick Today (Checkmates). Titled ‘Alive and Kicking’ – Alan Blackburn tracks down and talks to Gerry Temple (aka Keith De Groot) who spent quite a bit of time at 304 shortly after Joe opened the studio. RGM songwriter / artist and Joe’s confidant Tony Grinham (Tony Kaye) relates further disturbing incidents at the abandoned Warley Lea (near Brentwood) Farm. 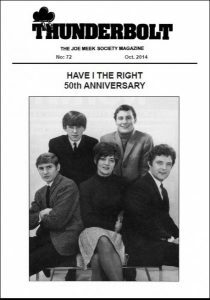 Plus…what happened when Joe Meek went there in 1966. Joe Meek and John Barry worked briefly together in 1959 on Lance Fortune’s Be Mine and Joe later employed JB7 guitarist Vic Flick on many a session. Geoff Leonard explores the background in great detail. John Repsch’s book interview concentrates upon Joe’s plan to launch Tony as a solo artist and goes into great detail about Joe’s deep personal (not sexual) friendship with Tony Dangerfield. Mark Newson briefly reviews Geoff’s RGM career and recalls a day that he spent chatting with Geoff at his Reading home. Mike Guy interviews Lissa Gray about her RGM sessions. Very useful first – hand background information. In 2008 Lissa Gray was still directing the Hampshire Youth Choir. The Rock’ n’ Roll Years – Chas Before Dave is a brilliant memoir of Chas Hodges’ early career in music. Naturally – RGM / Joe Meek stories / memories abound. Richard Myers is the reviewer. Rob Bradford examines Joe’s early ambient / Avant – Garde masterpiece in minute detail – drawing on a variety of sources for his track analysis. Alan Blackburn presents a very detailed account of the lives and musical career of the teenage duo and then Dave’s subsequent solo days at RGM. A brilliant and lengthy article covering many technical aspects of Joe’s recording techniques and a detailed overview of Joe’s studio equipment. Fully illustrated too. The vastly underrated LP had been out of print for nearly 30 years before it was finally reissued on CD. Rob Bradford examines the stories behind the tracks in some detail. Joe produced hundreds of outstanding instrumentals. Here, Ugly Things editor Mike Stax takes an intriguing look at c. 80 or so RGM instrumentals throwing up lots of interesting facts along the way. More Top 10 Favourite RGM tracks (as well as least favourites too!) from Thunderbolt readers. Alan Blackburn compiled all of the readers’ votes of the previous year to produce the Ultimate RGM Top 10 chart. Not surprisingly Telstar comes out at No.1. The No.1 least favourite track was The Checkmates’ You Got To Have A Gimmick Today. 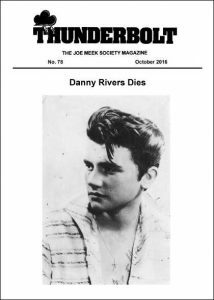 The late Keith Hunt (Johnny Kidd’s biographer) profiles the early life and musical career of Danny Rivers. The feature is accompanied by two great early photos of Danny. Ann Tydeman reviews an early ghost – written Sutch ‘autobiography’ by Peter Chippendale. Prolific author Alan Clayson was originally assigned to the project but abandoned it in despair at Sutch’s antics. The book is nowhere near as good as Graham Sharpe’s definitive tome from 2005. Back in July 1962 the launch of Telstar was an international phenomenon. The UK was no exception. 7 pages of reprints of fascinating articles / facts from all those years ago. Ian Oloffson recalls his early visits to London and meetings with Joe Meek to launch the recording career of RGM starlet Gunilla Thorne. Interesting reading. Tony Grinham ( Joe Meek artiste and friend of Joe -Tony Kaye) writes a spine – chilling account of his first visit to the decidedly creepy / spooky / eerie abandoned Warley Lea Farm in Essex. He experienced some frightening moments there – yet still returned (along with Joe Meek) the following year. Dave Adams’ personal account of his very first meeting with Joe and detailed memories of recording at Arundel Gardens with his sister, Joy Adams. How To Buy A Used Car And Save Money – This very useful book is reviewed by Mark Newson. Don had a variety of jobs after quitting the music business – including a used car salesman. Don wrote this book based on his experiences in the motor trade. Much of his advice is as relevant today as it was in 1992! Sometimes dubbed ‘The Wild man Of Rock’. Savages (and sometime Meek solo artist) bassist Tony Dangerfield certainly lived life on the edge until his recent death. Here’s a very wide – ranging, no holds barred, interview from from August 1983. Another gem from John Repsch. A great account of Heinz’s early career (unique information here) and his wild stage antics. Much of this is based on first – hand observations. The author is the late Keith Hunt. Michael Batory recalls the group’s days at 304 Holloway Road and his subsequent ‘career’ as an RGM songwriter. Lots of first – hand information. The group’s version of The Wilbur Brothers’ Knoxville Girl was banned by the BBC. Another instalment of JMAS members listing their personal Top 10 favourite RGM tracks as well as a Top 10 least favourites too! Laurence Brown reviews Rob Bradford’s biography of the late John Rostill. John went on to join The Shadows. However, he had previously auditioned for Joe Meek and was under consideration to play bass for The Tornados shortly after Heinz’s departure. The Scorpions recorded some excellent tracks for Joe under the guise of The Ferridays. These rarities remained unreleased for over 30 years. Alan Blackburn details their history, providing great RGM background information in the process. Gruesome and horrific contemporary accounts surrounding the grisly murder of London ‘Rent Boy’ Bernard Oliver in January, 1967. His dismembered and mutilated remains were dumped in a Suffolk field contained in two suitcases. At the time Joe Meek was worried that he could be implicated in the enquiry – as he certainly knew of the boy. 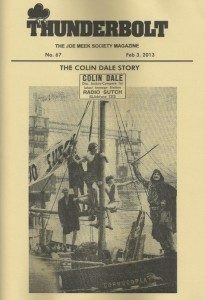 1964 saw the rise of the so – called ‘Pirate Radio’ stations. Never one to shun publicity – Screaming Lord Sutch teamed up with svengali / entrepreneur Reg Calvert (who was soon afterwards shot dead by a business rival) to launch Radio Sutch. The station was based in an old maritime fort just off the coast of Whitstable. Stefan Woroniecki tells the full story in some detail. Ricky Wayne went on to become a future Mr Universe. He was handsome and he was a passable singer. Alan Blackburn tells the story of how the combination of The Fabulous Flee – Rekkers and a certain Joe Meek helped to transform young Ricky in a Triumph Records recording star. Alan Blackburn takes a detailed look at the early career of Dave Adams. A versatile singer and instrumentalist, Dave was also a useful carpenter and did a lot of the fitting out at 304 Holloway Road. Joy Adams is also featured. The John Repsch book interviews. John interviewed hundreds of Joe’s artists whilst researching The Legendary Joe Meek – The Telstar Man. Here’s Part 3 of a very lengthy interview with Clem. To coincide with the LP / CD reissue of most of their recordings, the late Keith Hunt (Johnny Kidd’s biographer) offers up an interview with Peter Fleerackers. 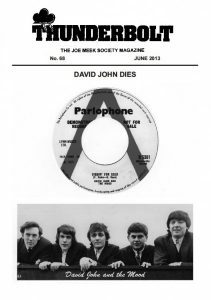 John Repsch takes a comprehensive look at 15 different Fanzines covering 50s / 60s music. Back in 1991 – very few people had actually heard Joe’s early Avant Garde masterpiece until it was finally issued on RPM records. Also, at that time, stereo LP recordings were still extremely rare. Philip Hutchinson offers a masterly assessment spread over 3 pages. Tony Grinham (Tony Kaye) became a close confidant of Joe Meek. Here he tells us about teaching Joe to paint as well as wandering around graveyards etc with Joe in true ‘Most Haunted’ fashion. Eerie! Hinton Sheryn was a legendary figure in the early JMAS days and had close Tornados connections too. Here he offers a fascinating insight into an early visit to 304 Holloway Road and his various meetings with Joe’s relatives. A page of cuttings / clippings relating to various RGM acts. Laurence Brown’s excellent article about the many groups, singers and labels who attempted to emulate that RGM sound. 30 tracks are covered (15 vocal, 15 instrumental) ranging from “Stormy Evening” to “Concerto In The Stars” and all points in between. A brilliant series – ‘Tornado Trails’ – this is Part 4 (the final part) by Alan Blackburn. Enormously detailed. This issue covers the years 1965 – 1967 when The Saxons evolved into The Tornados. Mick Mirams offers up some useful information mostly connected with The Tornados and then ranging over other RGM acts. The John Repsch book interviews. John interviewed hundreds of Joe’s artists whilst researching The Legendary Joe Meek – The Telstar Man. Here’s Part 2 of a very lengthy interview with Clem. This part focuses on Telstar. Daily Mirror cutting from 1964. Chad Christian was actually a very personable young girl. Nice pic of her with Heinz! Reprint of an article from The Islington Gazette of the day. John Repsch comments on some inaccuracies. A great Jim Blake feature focussing on ‘Joe’s Girls’. Jim examines the careers and recordings of Joy Adams, Pamela Blue, Judy Cannon, Glenda Collins, Billie Davis, Honey Lantree, Jennifer Moss, Kim Roberts, Gunilla Thorne…and more. The much – vaunted BBC Arena documentary aired in February 1991. It sparked off a media avalanche. Presented here are 9 pages of cuttings / clippings devoted to Joe Meek. Graham Winsor outlines his admiration of Joe and how he went about building up his RGM record collection. Lovely snapshots of social history too. A brilliant series – ‘Tornado Trails’ – this is Part 3 by Alan Blackburn. Enormously detailed. This issue covers the year 1965 in great depth. There’s also a very informative Tornados – related letter from Mick Mirams on pages 16 – 17. The John Repsch book interviews. John interviewed hundreds of Joe’s artists whilst researching The Legendary Joe Meek – The Telstar Man. Here’s Part 1 of a very lengthy interview with Clem. Crammed with amazing facts and anecdotes. Songs Of Death. Joe was obsessed with the occult & the paranormal. Here, Jim Blake expertly analyses twenty or so RGM ‘Death Discs’ and comments upon similar records of the early 1960s era. 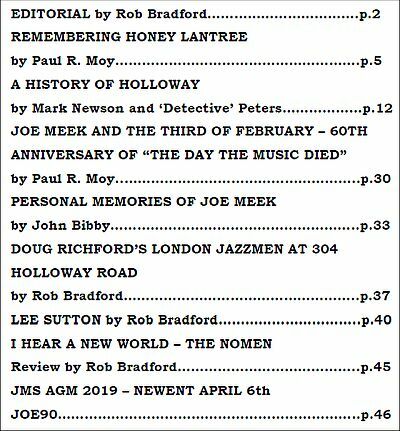 Jim Blake’s brilliant overview of what was happening Joe Meek / RGM – wise on February 3rd 1958 through to February 3rd 1967. Essential reading. Various cuttings documenting Heinz’s solo debut. The John Leyton Story – Part 3. Alan Blackburn concludes his fascinating and wonderfully detailed account of John’s RGM years. The late Keith Hunt (Johnny Kidd’s biographer) presents a concise synopsis of Lord Sutch’s career between 1960 and 1990. A brilliant series – ‘Tornado Trails’ – this is Part 1 by Alan Blackburn. Enormously detailed. The Tornados’ early career, personnel, Telstar sessions and much, much more. Very interesting music paper feature from 1961. Interesting music paper feature from 1961. The new committee shortly after formation of JMAS. Alan Blackburn relates and summarises a brief history of John Repsch’s epic biography of Joe Meek. The amazing book launch party at Lansdowne Studios on October 30th 1989. Reproduction of the original book cover and a smattering of early review comments. John Leyton Story – Part 1. Great feature by Alan Blackburn. Lots of detail about John’s early career and recording sessions at 304 Holloway Road. Many Photostats of sheet music, old N.M.E. charts etc. Joe Meek Hit Parade. Neat summary of all RGM chart entries taken from MM, NME and RM charts. ‘Birthday Times’ – A Hallmark Cards feature – Friday April 5th 1929. Joe’s birthday. Very interesting. Fascinating and detailed account by Jim Blake. How the original RGMAS (which preceded JMAS) had its origins right back on February 3rd, 1967.